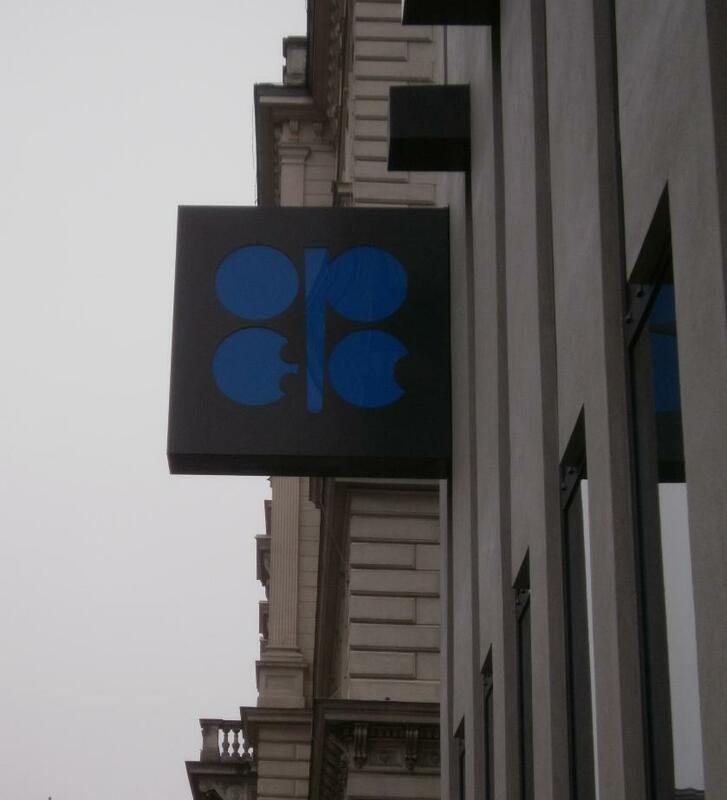 As widely expected and in line with market expectations, the 163rd OPEC meeting of ministers ended with the 12 members of the oil exporting club keeping their official collective production quota right where it was – at 30 million barrels per day (bpd). However, the cartel felt that whilst world economic growth was projected to reach 3.2% in 2013, up from 3% in 2012, downside risks to the global economy, especially in the OECD region, remain unchecked. OPEC said that world oil demand is expected to rise from 88.9 million bpd in 2012 to 89.7 million bpd in 2013, driven “almost entirely” by the non-OECD regions. It also projected non-OPEC supply to grow by 1.0 million bpd. El-Badri was not prepared to discuss the individual members’ quotas, a figure which OPEC no longer releases for publication. The Secretary General also revealed that no agreement was reached over the election of his successor with the same three candidates – viz the two protagonists Majid Munif (Saudi Arabia) and Gholam-Hussein Nozari (Iran) with compromise candidate Thamir Ghadban (an Iraqi official) – being in the frame. “The candidates remain the same, but if a fresh name comes up then we will examine his/her credentials in the usual way,” the Secretary General said. 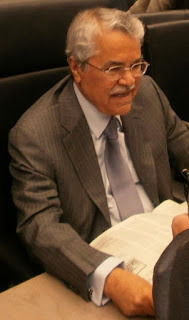 In his response to the debate about shale’s impact on OPEC members’ fortunes and a possible rise in their spare capacity, El-Badri said the impact of unconventional oil production remains uncertain and if it resulted in a rise in OPEC’s spare capacity then there was no reason to be alarmed. “I am in the business of conventional. The way I see it is that if it is a causative factor in a rise in OPEC’s spare capacity then I say why not? What’s the harm? The International Energy Agency (IEA) cannot have it both ways. Before the shale debate began, the agency expressed alarm at the perceived lack of OPEC’s spare capacity. Now when there is a perception that our spare capacity would rise, they again see it as a problem,” he added. El-Badri said OPEC members would, if required, take steps to ensure market balance and reasonable price levels for producers and consumers, and respond to developments that might place oil market stability in jeopardy. OPEC said its next meeting will convene in Vienna, Austria, on Dec 4, 2013. That’s all for the moment folks! Keep reading, keep it ‘crude’! © Gaurav Sharma 2013. OPEC Secretary General Abdalla Salem el-Badri speaks at the conclusion of the 163rd OPEC meeting of ministers © Gaurav Sharma, May 31, 2013. Any analysis of oil and gas depletion is always tricky and often coloured by opposing arguments, disinformation, politics, tangential debates about the resource curse hypothesis and extractive techniques. Given this backdrop, veteran industry analyst Colin J. Campbell’s attempt to tackle the subject via his Atlas of Oil and Gas Depletion, currently in its second edition, is nothing short of historic. This epic work banks on decades of painstaking research undertaken by Campbell in his quest to provide definitive and pragmatic commentary on the subject of depletion. Nine parts and 77 chapters split this weighty, authoritative volume on the subject; wherein part by part, page by page it examines oil and gas depletion by region and jurisdictions. Not only has geology been taken into consideration but also the political climate of each region and country in question. The author also discusses the impact of emergent technologies and the costs involved relative to each E&P jurisdiction with a separate examination of conventional and unconventional sources. Accompanying discourse on the history of the oil and gas business is carved up into two halves – the first half discusses the formation of the oil industry, which oversaw (or rather fuelled) the exponential growth of the global economy. The second half talks of a contraction as the easy to extract supplies dwindle, and the barrel spent per barrel extracted equation starts getting more and more worrying. Campbell also discusses reporting practices and industry data interpretation techniques. The Atlas switches seamlessly to a country-by-country analysis in alphabetical order by continent. Every country imaginable in the context of the oil and gas business and even those that are unimaginable in mainstream discourse about our 'crude' world are examined, substantiated by industry data and accompanying graphics. For purposes of reviewing the contents, the Oilholic selected 10 jurisdictions commonly associated with the E&P industry and another 10 jurisdictions, hitherto considered net oil importers. This blogger was quite simply blown away by sincerity and effort of the research, along with the brevity with which jurisdictional summation was provided duly taking each country’s 'crude' history into the equation. As a reader, you appreciate a book when it adds to your knowledge; Campbell’s Atlas certainly did it for yours truly. If you are looking for an authoritative analysis of oil and gas depletion, minus caricature, clichés and political statements, but full of rational and apolitical scrutiny of the costs involved with extracting oil and gas, then look no further than this book. 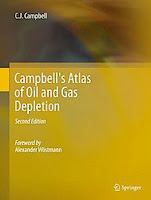 For an evolving industry, which has a finite natural resource as its core offering, Campbell’s Atlas of Oil and Gas Depletion is likely to stand the test of time. The Oilholic is happy to recommend this book, and humbled to provide a review for the research conducted by an analyst of Campbell's credentials. The Atlas will educate and inform those interested in the oil and gas industry's future and the challenges it faces – be they existential or commercial. In particular, those professionals involved with policymaking, petroleum economics, history of the oil and gas business, academia and market analysis. There was only story in London town last week, when late in the day on May 14, European Commission (EC) regulators swooped down on the offices of major oil companies having R&M operations in the UK, investigating fuel price fixing allegations. While the EC did not name names, BP, Shell and Statoil confirmed their offices had been among those ‘visited’ by the officials. More details emerged overnight, as pricing information provider Platts admitted it was also paid a visit. The EC said the investigation relates to the pricing of oil, refined products and biofuels. As part of its probe, it will be examining whether the companies may have prevented others from participating in the pricing process in order to "distort" published prices. That process, according to sources, is none other than Platts’ Market On Close (MOC) price assessment mechanism. "Any such behaviour, if established, may amount to violations of European antitrust rules that prohibit cartels and restrictive business practices and abuses of a dominant market position," the EC said, but clarified in the same breath that the raids itself did not imply any guilt on part of the companies. The probe extends to alleged trading malpractices dating back almost over 10 years. All oil companies concerned, at least the ones who admitted to have been visited by EC regulators, said they were cooperating with the authorities. Platts issued a similar statement reiterating its cooperation. So what does it mean? For starters, the line of inquiry is nothing new. Following a very vocal campaign led by British parliamentarian Robert Halfon, the UK's Office of Fair Trading (OFT) investigated the issue of price fixing and exonerated the oil companies in January. Not satisfied, Halfon kept up the pressure and here we are. "I have been raising the issue of alleged fuel price fixing time and again in the House of Commons. With the EC raids, I'd say the OFT has been caught cold and simply needs to look at this again. The issue has cross-party support in the UK," he said. In wake of the raids, the OFT merely said that it stood by its original investigation and was assisting the EC in its investigations. Question is, if, and it’s a big if, any wrongdoing is established, then what would the penalties be like and how would they be enforced? Parallels could be drawn between the Libor rate rigging scandal and the fines that followed imposed by US, UK and European authorities. The largest fine (to date) has been CHF1.4 billion (US$1.44 billion) awarded against UBS. So assuming that wrongdoing is established, and fines are of a similar nature, Fitch Ratings reckons the companies involved could cope. "These producers typically have between US$10 billion and US$20 billion of cash on their balance sheets. Significantly bigger fines would still be manageable, as shown by BP's ability to cope with the cost of the Macondo oil spill, but would be more likely to have an impact on ratings," said Jeffrey Woodruff, Senior Director (Corporates) at Fitch Ratings. Other than fines, if an oil company is found to have distorted prices, it could face longer-term risks from damage to its reputation. While these risks are less easy to predict and would depend on the extent of any wrongdoing, scope does exist for commercial damage, even for sectors with polarising positions in the public mind, according to Fitch. Given we are in the 'early days' phase, let's see what happens or rather doesn't. While the EC was busy raiding oil companies, the IEA was telling the world how the US shale bonanza was sending ripples through the oil industry. In its Medium-Term Oil Market Report (MTOMR), it noted: "the effects of continued growth in North American supply – led by US light, tight oil (LTO) and Canadian oil sands – will cascade through the global oil market." While geopolitical risks persist, according to the IEA, market fundamentals were indicative of a more comfortable global oil supply/demand scenario over the next five years at the very least. The MTOMR projected North American supply to grow by 3.9 million barrels per day (mbpd) from 2012 to 2018, or nearly two-thirds of total forecast non-OPEC supply growth of 6 mbpd. World liquid production capacity is expected to grow by 8.4 mbpd – significantly faster than demand – which is projected to expand by 6.9 mbpd. Global refining capacity will post even steeper growth, surging by 9.5 mbpd, led by China and the Middle East. According to the IEA, having helped offset record supply disruptions in 2012, North American supply is expected to continue to compensate for declines and delays elsewhere, but only if necessary infrastructure is put in place. Failing that, bottlenecks could pressure prices lower and slow development. 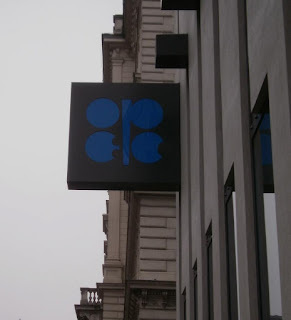 Meanwhile, OPEC oil will remain a key part of the oil mix but its production capacity growth will be adversely affected by "growing insecurity in North and Sub-Saharan Africa", the agency said. 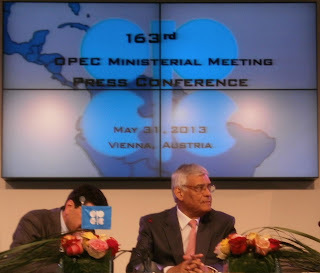 OPEC capacity is expected to gain 1.75 mbpd to 36.75 mbpd, about 750,000 bpd less than forecast in the 2012 MTOMR. Iraq, Saudi Arabia and the UAE will lead the growth, but OPEC's lower-than-expected aggregate additions to global capacity will boost the relative share of North America, the agency said. Away from supply-demand scenarios and on to pricing, Morgan Stanley forecasts Brent's premium to the WTI narrow further while progress continues to be made in clearing a supply glut at the US benchamark’s delivery point of Cushing, Oklahoma, over the coming months. It was above the US$8 mark when the Oilholic last checked, well down on the $20 it averaged for much of 2012.However, analysts at the investment bank do attach a caveat. Have you heard of the Houston glut? There is no disguising the fact that Houston has been the recipient of the vast majority of the "new" inland crude oil supplies in the Gulf Coast [no prizes for guessing where that is coming from]. The state's extraction processes have become ever more efficient accompanied by its own oil boom to complement the existing E&P activity. Lest we forget, North Dakota has overtaken every other US oil producing state in terms of its oil output, but not the great state of Texas. Yet, infrastructural limitations persist when it comes to dispatching the crude eastwards from Texas to the refineries in Louisiana. So Morgan Stanley analysts note: "A growing glut of crude in Houston suggests WTI-Brent is near a trough and should widen again [at least marginally] later this year. Houston lacks a benchmark, but physical traders indicate that Houston is already pricing about $4 per barrel under Brent, given physical limitations in moving crude out of the area." The Oilholic can confirm that anecdotal evidence does seem to indicate this is the case. So it would be fair to say that Morgan Staley is bang-on in its assessment that the "Houston regional pricing" would only erode further as more crude reaches the area, adding that any move in Brent-WTI towards $6-7 a barrel [from the current $8-plus] should prove unsustainable. Capacity to bring incremental crude to St. James refineries in Louisiana is limited, so the Louisiana Light Sweet (LLS) will continue to trade well above Houston pricing; a trend that is likely to continue even after the reversal of the Houston-Houma pipeline – the main crude artery between the Houston physical market and St. James. On a closing note, it seems the 'Bloomberg Snoopgate' affair escalated last week with the Bank of England joining the chorus of indignation. It all began earlier this month when news emerged of Bloomberg's practice of giving its reporters "limited" access to some data considered proprietary, including when a customer looked into broad categories such as equities or bonds. The scoop – first reported by the FT – led to a full apology by Matthew Winkler, Editor-in-chief of Bloomberg News, for allowing journalists "limited" access to sensitive data about how clients used its terminals, saying it was "inexcusable". However, Winkler insisted that important and confidential customer data had been protected. Problem is, they aren't just any customers – they include the leading central banks in the OECD. The US Federal Reserve, the European Central Bank and the Bank of Japan have all said they were examining the use of data by Bloomberg. However, the language used by the Bank of England is the sternest so far. The British central bank described the events at Bloomberg as "reprehensible." 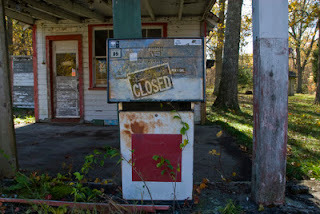 A spokesperson said, "The protection of confidential information is vital here at the bank. What seems to have happened at Bloomberg is reprehensible. Bank officials are in close contact with Bloomberg…We will also be liaising with other central banks on this matter." In these past few days there have been signs that 'Bloomberg Snoopgate' is growing bigger as Brazil’s central bank and the Hong Kong Monetary Authority (the Chinese territory's de facto central bank) have also expressed their indignation. Having been a Bank of England and UK Office for National Statistics (ONS) correspondent, yours truly can personally testify how seriously central banks take issue with such things and so they should. Yet, in describing Bloomberg's practice as "reprehensible", the Bank of England has indicated how serious it thinks the breach of confidence was and how miffed it is. The UK central bank has since received assurances from Bloomberg that there would be no repeat of the issue! You bet! That's all for the moment folks! Keep reading, keep it 'crude'! The Oilholic has patiently waited for the fans and despisers of former British Prime Minister Margaret Thatcher to quieten down, in wake of her death on April 8, 2013, before giving his humble take on what her premiership did (or in many cases didn’t) for the UK oil and gas Inc. and what she got in return. Her influence on the North Sea exploration and production certainly got a mention in passing in all the tributes and brickbats thrown at the Iron Lady, the longest serving (1979-1990) and only female British Prime Minister. 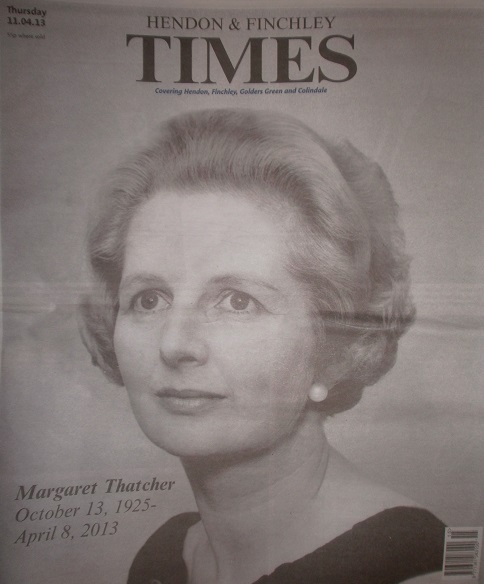 The world’s press ranging from The Economist to the local paper in her former parliamentary constituency – The Hendon & Finchley Times (see covers below) – discussed the legacy of the Iron Lady; that legacy is ‘cruder’ than you think. 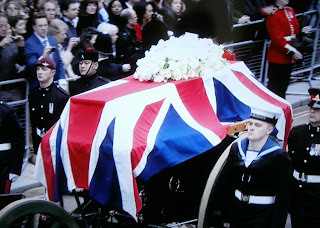 In the run-up to Thatcher's all-but-in-name state funeral on April 17, the British public was bombarded with flashbacks of her time in the corridors of power. In one of the video runs, yours truly glanced at archived footage of Thatcher at a BP production facility and that said it all. Her impact on the industry and the industry’s impact itself on her premiership were profound to say the least. The virtue of private free enterprise got instilled into the UK oil and gas industry in general and the North Sea innovators in particular thanks to Thatcher. But to say that the industry somehow owed the Iron Lady a debt of gratitude would be a travesty. Rather, the industry repaid that debt not only in full, but with interest. Just as Thatcher was coming to power, more and more of the crude stuff was being sucked out of the North Sea with UK Continental Shelf (UKCS) being much richer in those days than it certainly is these days. The UK Treasury, under her hawk-eyed watch, was quite simply raking it in. According to the Office for National Statistics (ONS) data, government revenue from the oil and gas industry rose from £565 million in fiscal year 1978-79 to £12.04 billion in 1984-85. That is worth over three times as much in 2012 real-terms value, according to a guesstimate provided by a contact at Barclays Capital. Throughout the 1980s, the Iron Lady made sure that the revenue from the [often up to] 90% tax on North Sea oil and gas exploration and production was used as a funding source to balance the economy and pay the costs of economic reform. Over three decades on from the crude boom of the 1980s, Brits do wish she had examined, some say even adopted, the Norwegian model. That she privatised the BNOC does not irk the Oilholic one bit, but that not even a drop of black gold and its proceeds – let alone a full blown Norwegian styled sovereign fund – was put aside for a rainy day is nothing short of short-termism or short-sightedness; quite possibly both. One agrees that both macroeconomic and demographical differences between Norway and the UK complicate the discussion. This humble blogger doubts if the thought of creating a sovereign fund didn’t cross the Iron Lady’s mind. But unquestionably, as oil and gas revenue was helping in feeding the rising state benefits bill at the time – all Thatcher saw in Brent, Piper and Cormorant fields were Petropounds to balance the books. And, if you thought the ‘crude’ influence ended in the sale of BNOC, privatisation drives or channelling revenue for short-term economic rebalancing, then think again. Crude oil, or rather a distillate called diesel, came to Thatcher’s aid in her biggest battle in domestic politics – the Miners’ Strike of 1984. Pitting her wits against Arthur Scargill, the National Union of Mineworkers’ (NUM) hardline, stubborn, ultra-left leader at the time, she prevailed. In March 1984, the National Coal Board (NCB) proposed to close 20 of the 174 state-owned mines resulting in the loss of 20,000 jobs. Led by Scargill, two-thirds of the country's miners went on strike and so began the face-off. But Thatcher, unlike her predecessors, was ready for a prolonged battle having learnt her lesson in an earlier brief confrontation with the miners and knew their union’s clout full well based on past histories. This time around, the government had stockpiled coal to ensure that power plants faced no shortages as was the case with previous confrontations. Tongue-tied in his vanity, Scargill had not only missed the pulse of the stockpiling drive but also failed to realise that many UK power plants had switched to diesel as a back-up. Adding to the overall idiocy of the man, he decided to launch the strike in the summer of 1984, when power consumption is lower, than in the winter. Furthermore, he refused to hold a ballot on the strike, after losing three previous ballots on a national strike (in January 1982, October 1982 and March 1983). The strike was declared illegal and Thatcher eventually won as the NUM conceded a year later in March 1985 without any sizable concessions but with its member having borne considerable hardships. The world was moving away from coal, to a different kind of fossil fuel and Thatcher grasped it better than most. That the country was a net producer of crude stuff at the time was a bonanza; the Treasury’s to begin with as she saw it. 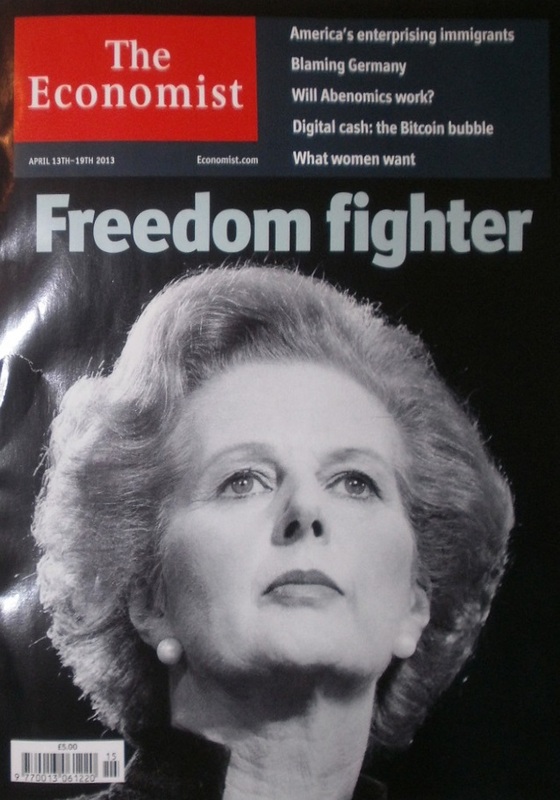 The Iron Lady left office with an ‘ism’ in the shape of 'Thatcherism' and bred 'Thatcherites' espousing free market ideas and by default making capitalism the dominant, though recently beleaguered, economic system of our time. Big Bang, the day [October 27, 1986] the London Stock Exchange's rules changed, following deregulation of the financial markets, became the cornerstone of her economic policy. In this world there are no moral absolutes. So the Oilholic does not accept the rambunctious arguments offered by left wingers that she made ‘greed’ acceptable or that the Big Bang caused the global financial crisis of 2007-08. Weren’t militant British unions who, for their own selfish odds and ends, held the whole country to ransom throughout the 1970s (until Thatcher decimated them), greedy too? If the Big Bang was to blame for a global financial crisis, so was banking deregulation in the UK in 1997 (and elsewhere around that time) when she was not around. They say that the late Venezuelan president Hugo Chavez stage-managed 'Chavismo' and bred 'Chavistas' from the proceeds of black gold. The Oilholic says 'Thatcherism' and 'Thatcherites' have a ‘crude’ dimension too. Choose whatever evidence you like – statistical, empirical or anecdotal – crude oil bankrolled Thatcherism in its infancy. That is the unassailable truth and that’s all for the moment folks! Keep reading, keep it ‘crude’! © Gaurav Sharma 2013. Photo 1: Baroness Margaret Thatcher’s funeral cortege with military honours, April 17, 2013 © Gaurav Sharma. Photo 2: Front page of the Hendon & Finchley Times, April 11, 2013. Photo 3: Front cover of the The Economist, April 13, 2013.